Order of Selichot, according to the rite of Lesser and Greater Poland. Slavita: R. Moshe Shapira, . 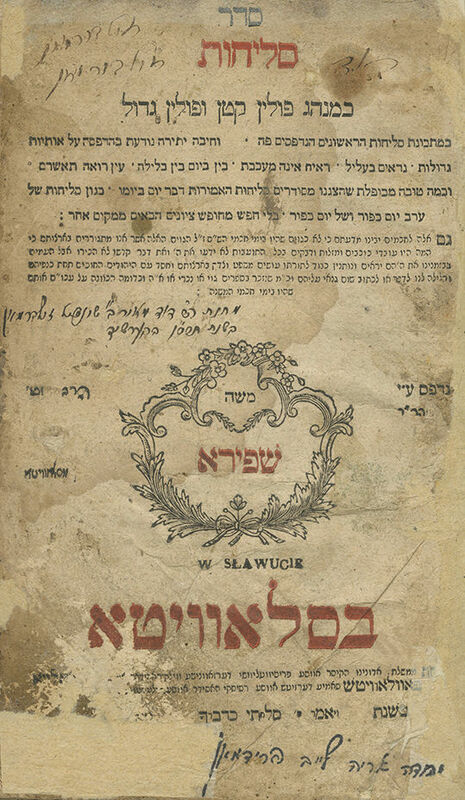 The word "Selichot", the place of printing and name of the printer – "Shapira", are printed in red ink. Signature on title page: "David Zilberman". Handwritten dedication: "Gift from R. David Meir son of Sheindel Zilberman, in Bershad, 1906". 107 leaves. 20 cm. Fair-good condition. Stains and wear, dampstains. Tears to title page, affecting text of imprint. Minor damage to two leaves following title page. Worming, some repaired. Inscriptions and stamps. Last leaf trimmed close to text, affecting heading. New leather binding.